The top diplomats of Japan and South Korea are closing ranks on their demand that North Korea return to negotiations to end its nuclear weapons programs. After a meeting in the South Korean capital, Tokyo's foreign minister also offered regrets aimed at soothing historical Korean grievances. The foreign ministers of South Korea and Japan demanded Thursday North Korea come back unconditionally to six-nation talks aimed at getting rid of its nuclear weapons capability. 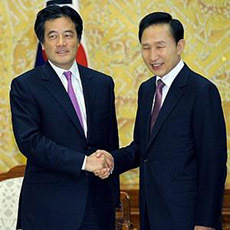 After talks with his Japanese counterpart Katsuya Okada, South Korean Foreign Minister Yu Myung-hwan downplayed Pyongyang's recent demands for international sanctions to be lifted before it returns to talks. He says South Korea and Japan share the view that North Korea should first return to six-party talks, and that there should be "practical progress" on scaling back its nuclear programs. North Korea also recently repeated its demands for peace treaty negotiations for the Korean peninsula as a condition for disarmament. A 1953 armistice ended three years of fighting after North Korea invaded the South, but the conflict was never formally concluded. More than four years ago, North Korea signed an agreement with China, Russia, Japan, South Korea and the United States on getting rid of its nuclear weapons. In return, it was to get benefits such as aid and eventually peace negotiations. Since then, North Korea has tested two nuclear devices. Washington says no peace treaty is possible with the North until there is substantial progress on the nuclear issue. Likewise, South Korean officials describe North Korea's demands for peace negotiations as premature and unhelpful. The South Korean and Japanese foreign ministers said Thursday their two countries' relationship is becoming "closer than ever." Minister Okada offered a statement of regret on the part of his government for Japan's colonial rule of the Korean peninsula. He says, 100 years ago Japan deprived Koreans of their nation and left a great wound on their national pride. He says we should not forget the pain of the victims of that period. Korea spent the first half of the twentieth century under harsh Japanese rule. The governments of both North and South Korea have accused Japan in the past of failing to atone sufficiently for that time, and glossing over the era in its school textbooks.